He who starts another quarrel shall be turned into a rock in the very place he stands." Sa toe faapea atu le toeaina, afai ae toe misa oulua o le a liu ma'a loa i le mea o lo'o tu ai." 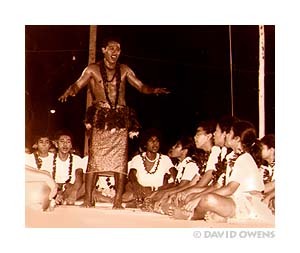 Samoan language has a rich oral tradition carried on through story and dance from generation to generation. Samoan language was written down by missionaries who introduced some new letters to the alphabet to aid in translating the Bible. Read more about how missionaries changed the Samoan language. Samoan language at the fale (house). American Samoans have a rich language that remains the main language of the people. English is the second language and all islanders can speak English as well. There are several levels of spoken language. The high talking chiefs have a high oratory of rhetoric that only the indoctrinated can understand. They are the politicians and negotiators. There are regular chiefs that speak the everyday language of the people and get things done. Many have noticed how similar this is to mainland American society. These pages convey a little of the everyday language. Palagis (foreign white people) who try to learn are a great source of entertainment to native speakers. Learn to laugh along with them and be grateful their English is better than your Samoan!